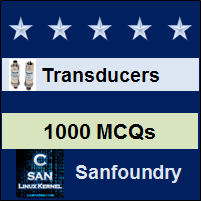 This set of Instrumentation Transducers Multiple Choice Questions & Answers (MCQs) focuses on “IR Radio Sensors”. 1. Which of the following is not a part of electro magnetic radiation? Explanation: All three regions mentioned are part of electro magnetic radiation. 2. Which of the following represents IR wavelength? Explanation: IR radiation wavelength is in the region between 700 nm and 2500 nm. Explanation: Sources that produce IR radiation may be thermal or non-thermal in behaviour. 4. Every hot body emits IR radiation. Explanation: IR radiation is the heat wave and every hot body emits IR radiation. Explanation: Tungsten filament lamp is a non-thermal source of IR radiation. 6. Which of the following is correct for non-thermal source? Explanation: Non thermal source of IR radiation doesn’t need an external power supply. Explanation: LED and laser emit radiation in narrow range bandwidth. Explanation: All of the mentioned devices can act as a sensing element in the IR thermal detector. 9. Which of the following is the correct relationship for sensitivity? Explanation: Sensitivity is the ratio of a signal obtained to power. 10. Sensitivity can represent in terms of the lumen. Explanation: In photonic applications, sensitivity is expressed in terms of the lumen.